Preheat oven to 350 degrees F. Coat a large cookie sheet with cooking spray. In a medium bowl, sift together flour, cocoa powder, baking soda, and salt; whisk in sugar and chocolate chips until combined. In a large mixing bowl, whisk together banana, eggs, peanut butter and vanilla until well combined. Stir in dry ingredients until well combined. Divide dough and shape into three (9 x 2 1/3–inch) logs on cookie sheet. Bake for 30 minutes; cool 5 minutes before transferring logs to wire racks to cool an additional 15 minutes. Transfer to a cutting board and cut rolls diagonally into 1/2-inch thick slices. Place, cut sides down, on baking sheet. Reduce oven temperature to 300 degrees; bake 10 minutes. Turn cookies over; bake an additional 15 minutes (cookies will be slightly soft in center but will harden as they cool). Remove from baking sheet; cool completely on wire racks. Dip in melted chocolate if desired. 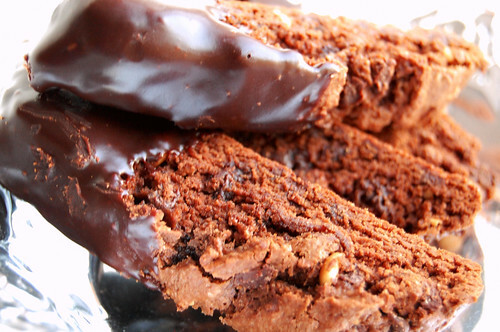 47 comments on "Chunky Monkey Biscotti"
oh my! 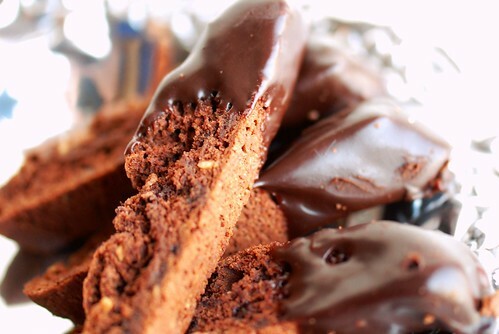 these biscotti look so so good :) and they ve got all my favourite ingredients too. You never cease to surprise me. Ha I ve done the surprised look when I saw medjol dates at the supermarket . i was surprised I was going to jump with joy. pity no one shared that enthusiasm with me. Have to try this recipe must be so good. What a wonderful idea for all those bananas stashed in my freezer - yum! Well, maybe a leetle bit healthy! Great biscotti recipe. I have the mini bananas frequently. I like them because they make a super snack...I often don't want to eat a whole banana. I don't find them as sweet, but I like them anyway. We can't get them all the time, but every once in a while at Whole Foods, there they are. We ate them often in the Caribbean. I've bought the mini bananas because I was seduced by their cuteness, but you're right they were a disappointment. I though for sure my kids would love them...being mini and all, but nope, no one liked them. What a great idea with the biscotti, it sounds delish! I do not like biscotti because it's soooo bland, BUT this is one I would devour. Oh my, these sound fabulous! I've never made biscotti before, but I'm going to start now. I've never had mini bananas...who knew they tasted different than the regular ones?! I have a ton of bananas to use up, this will be perfect! The reason bananas don't freeze completely has to do with the water content. The more 'impurities' that are in water, the more it's freezing temperature is lowered, and the less completely it will freeze at 32F. That's why salt is used on snowy roads. It adds enough impurity to the water that the freezing temperature is lowered enough to keep it from turning to ice...in most places. States further north, like the UP of Michigan and Canada use dirt instead of salt because the temperatures get so cold that the salt isn't effective at keeping the snow in the liquid phase. So anyways, the lower the water content in fruit, the less completely it will freeze. Those mini bananas look super cute but not as good as your biscotti. YUM! I miss bananas. I'm probably the only person in the world for whom bananas irritate the stomach. They give me a bizarre form of heartburn. It's very odd. I do sometimes take the risk and make a banana dessert. in fact, making dessert seems to lessen the effect! Totally healthy BTW. All of those chocolate antioxidants! I don't think I've had mini bananas before, but I always wanted to try red bananas! I bought plantains a few times and I actually let them go bad. I mean like black plus super mushy. It was terrible. Delicious, I love the peanut butter addition! I made a banana bread biscotti that ended up softening after a time. Maybe I didn't cook them enough, hm. Anyway, chocolate+banana+peanut butter in biscotti=brilliant. wow those sound AWESOME! great recipe girl! healthy or not, i'll take one :) heck, i just put bacon in my cookies! This is such a fun post. Mini bananas aren't as sweet as the regular ones (which you've discovered) but what's cool is that they can be used in savory recipes! (Almost like you would sweet plantains.) Plust they're just so cute! Oh and I think it's the sugar that keeps the bananas from freezing. Have you tried that recipe that's been going around where you freeze super ripe bananas then blitz them up in a blender and basically have creamy 1-ingredient banana "ice cream"? Kind of awesome. Your biscotti look EXTRA awesome though! Whaaaaa, this look so incredibly good!!! YUMMM!!!! Those look great! I bet they're delicious dunked into some hot coffee. You are killing me with your biscotti, and you may know of my LOOOVE of all things banana! This biscotti looks delicious!!! Also I do not like mini bananas as much as big bananas either. I think they taste kinnda weird. 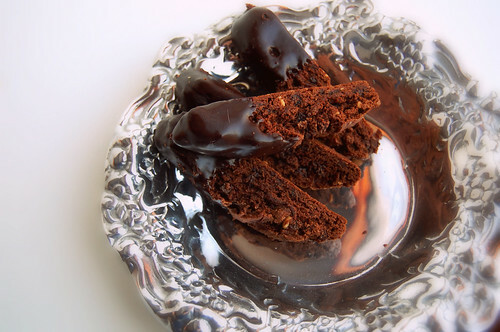 What a great twist on biscotti - yum! I get excited in the grocery store all the time too! Yummy...as usual. It doesn't even matter what's in those. They are GORGEOUS! Did you use your new equipment to photograph them? what a lovely post! u got me laughing at your responses :) over Christmas when i went home, i went food shopping for christmas dinner stuff with my mum and sis. We found some mini bananas and oohed aahed over em, only to finally throw them in our shopping baskets! they were too cute to pass up on. lovely biscotti - who doesn't not like the chunky monkey combo? mmmm. I don't like mini-bananas either..
baby bananas are sooo cute!! my kids like to eatem as often as theyre available. they fit nicely in lunchboxes&are easy to peel. they disgust me. cant stand the smell of them tho. i do, however, enjoy banana bread spread with a layer of fluffy cream cheese. my great aunt used to bake b-bread in a coffee can. then sliced it&spread with cream cheese!!!! cute little tea sandwiches!! hungry for it now!!! Just tried your recipe tonight...thank you! I had a banana on its way out, so he was put to good use instead of being thrown out. The biscotti turned out great! I didn't dip them in chocolate out of laziness, but I did enjoy one after dinner with my tea. Tamily, ewww. Banana flavored liquid doesn't sound good at all. You have my sympathy. Debbie, I saw those! I wanted to try them, but this was after I bought the mini bananas, and I didn't want to risk it. AJ, thank you!!! You're so wise. Christina, these do soften up after a day or two, but they're still delicious. You can pop them in the oven and re-crisp them too. Alejandra, no I haven't tried that. I have tried a Goofy's Banana Milk Shake fromt Disney cookbook for kids though. Sue, this was my first time trying the equipment out, and I ran out of time. So I rushed these pictures. Carol... Aunt Carol? Mmm banana bread in a coffee can. I love banana cread. Another brilliant biscotti recipe with all the flavors I love! Yum! Little bananas are so cute, but I've never actually bought them. Think I'll stick with the regular ones from now on...and I love them frozen. It's like eating banana ice-cream! Love anything with Chunky monkey in it! I also love the printable recipe button, thanks! I just love the name! Hey Em, Happy New Year and I hope that your dream of going to Culinary School becomes a reality soon. I was feeling like I wanted to bake something I'd never baked before tonight, and what do you know - I've never made biscotti before. These turned out great! Thanks for the recipe! what a great idea! I really want to try these- I've been on a biscotti kick for awhile now! You are so creative! I keep saying I need to make some biscotti. This sounds like a great recipe. And healthy. Because of the fruit. That's my story and I'm sticking to it. LOL - sure, they're kinda healthy - they contain bananas, and chocolate has anti-oxidants. Yum. Chunky Monkey is my favorite ice cream. When I worked at a coffee shop, we rosted and flavored our own beans, and I would make my own Chunky Monkey flavored bean blend- banana, chocolate and vanilla nut. I would luuuurve a cup of that with one of these biscotti. Your biscotti sounds amazing Emily! I think those mini bananas are Apple Bananas ... very popular here in Hawaii but I don't care for them myself either. Woo! These are sooooo good! Thanks for a great recipe to use up a blackened banana. 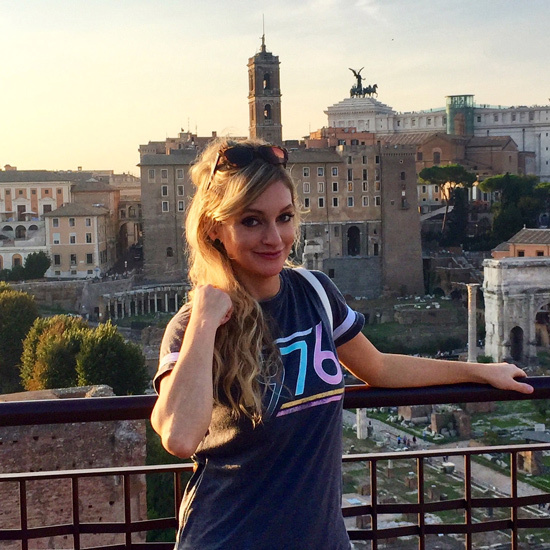 Glad you liked them, Kate! Ok, so I just baked these. And they are GOOD! I didn't feel like chocolate though so I didn't but the cocoa powder and I changed the chipits for white chocolate. These biscottis are sooo good! They are still a bit chewy and the middle, it's perfect. And the batter was so good, I ate so much of it! Anyways great recipe and I will keep it carefully. I love your blog and have made one or two of your recipes, but this one...oh my. I had all the ingredients and bananas which needed to be used. So I did. YUM!!! I've never made biscotti but I'll keep this recipe! YUM again!